By the end of this session it really felt like things were gearing up. Don’t worry I am going to cover all of the details in this recap. But before we get to that, make sure you have caught up with the first two sessions, and if you missed it, last week I made a personal vlog whilst I was busy working on my Session #2 homework: view here! In this weeks session it was time for me to recap my advanced product research where I revealed my top two product ideas. This was narrowed down from 43, to 5 and then the final 2 product ideas. We also announced which product that I am going to launch so if you do nothing else, make sure you check out the rest of this post to find out! Utilizing all of this, and all of your research thus far, to decide which product idea to invest in! First up, Greg handed over to me to share some more of my Advanced Product Research findings for my top 5 products. In case you forgot, those were: cardboard boxes, full face snorkel, sleeping bag, baby sling & travel pillows. On further inspection, this product idea looked like it might be more difficult to pursue than I first thought. All of the sellers are FBM which indicated to me that this may actually be a large and heavy item to ship and incur larger FBA fees. I also noticed from searching on Alibaba that there weren’t that many suppliers in China. I did find a few UK based suppliers though! For these reasons, I decided not to shortlist this product idea for this product launch. However, the demand is still very high for UK marketplace standards, and I think it could definitely be a profitable idea with the right investigation and strategy. As stated in my vlog, I found that many competitor listings were quite poor for sleeping bags. This filled me with hope as I know we are going to create a really strong listing for which ever product we launch. Whereas some of the existing sleeping bag listings have short titles with no keywords, barely any descriptions or features and poor photography. Another great thing about this product was that it had very low seasonality. I was worried it would be a summer item but it’s definitely not. Not only that, there were lots of suppliers showing on Alibaba and the initial cost of manufacturing looked very promising too. This one made it to my top two product ideas! 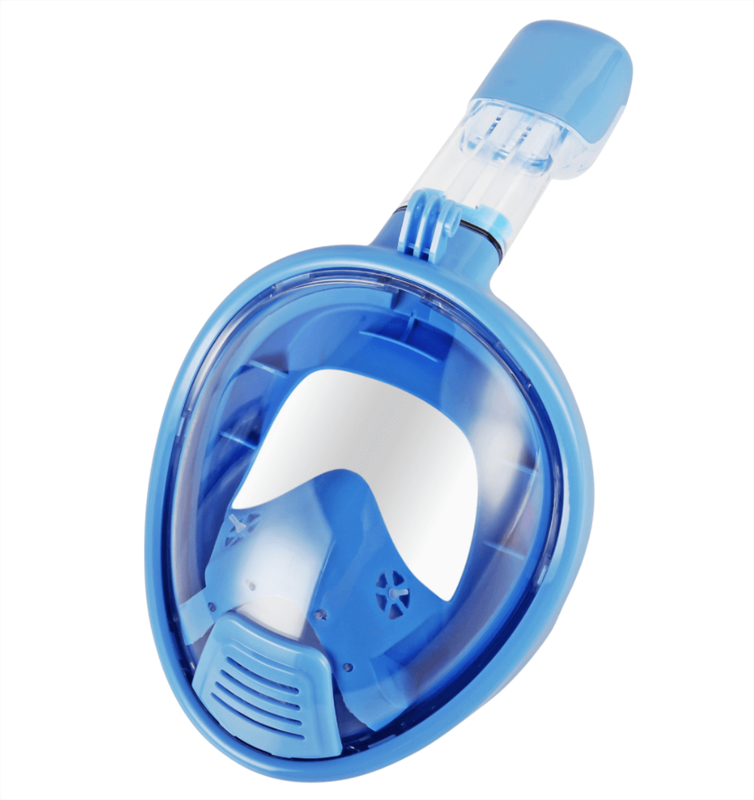 There were actually a lot of suppliers on Alibaba when searching for “full face snorkel” which I wasn’t expecting. The initial cost guide looked promising too. However I am really not sure about the legal aspects of this product. As Greg mentioned back in Session 2, there probably are no existing patents as there are plenty of FBA sellers already selling these snorkels. But this is just a hunch and there could be a patent pending. I still think this is a great product idea but it would require further legal investigations to be on the safe and sure side. For that reason I decided not to shortlist it right now. Again I covered this in my vlog update but I spotted that no PPC ad spots were being used by FBA sellers of travel pillows when I looked whilst researching. There was just a big banner ad for the brand Silentnight selling pillows. I assume that these sellers aren’t bidding, or have poor PPC campaigns in place and struggling to compete. Again this is positive as I know we’re going to go in strong with a great PPC strategy. This opens up an opportunity. This item also has plenty of suppliers listed on Alibaba, the rough cost guide looks good, and it’s super easy to bundle with things like ear plugs and eye masks. 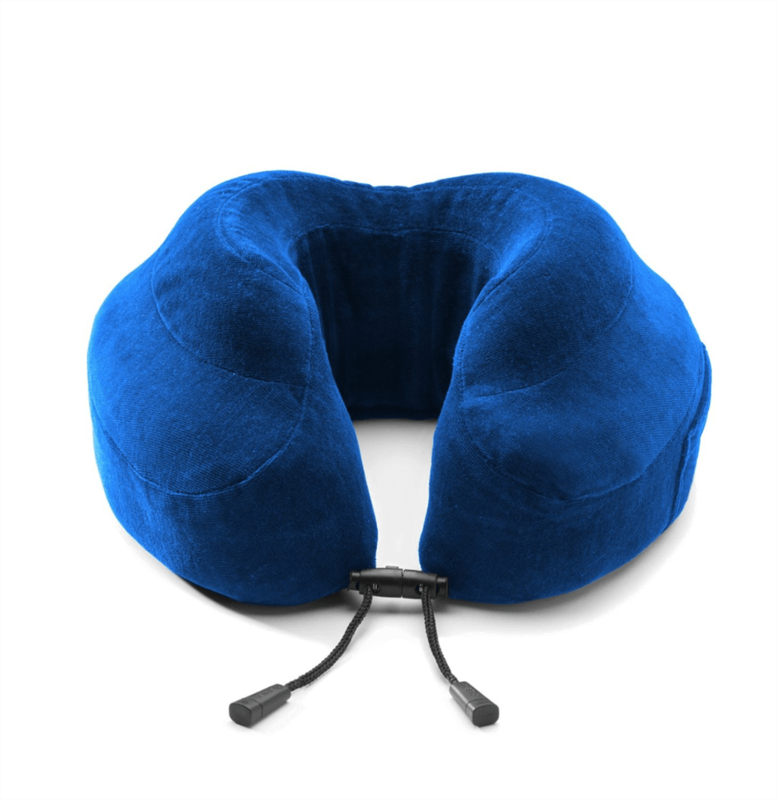 Guess what – travel pillows made it to the top two! 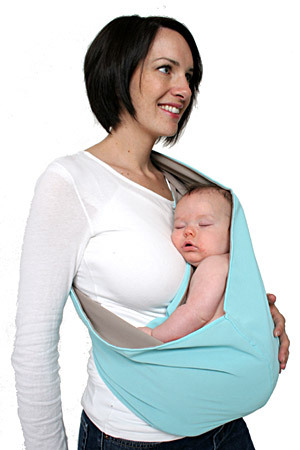 I loved this product idea but the main reason why it didn’t make it to my top two was that the demand was lower than the sleeping bags and travel pillows. Considering we have a huge target to hit $1 Million in revenue for charity, I had to put my feelings about the product aside. Other than that it’s vital stats looked good. Easy and cheap to manufacture with a good amount of existing suppliers on Alibaba, low seasonality. At an initial profitability glance it would be a strong product. If you’re still researching products, use the Chrome Extension to validate your product ideas and check out the competition! With all of that researched, it was time to start contacting suppliers for my top product ideas to get a better idea of the cost of manufacturing. This would ultimately help me to do some early profit calculations (which are explained further along in this post), and decide which product to launch. First up, Greg gave some great over-arching insights into sourcing from China in general. Make sure you catch this in the replay if you are new to this. To give an overview, you do not need to speak Chinese as most factories will have English speaking sales reps. Although Chinese business culture can sometimes get a bad rep, it’s actually very viable to develop long-term business relationships, and you don’t necessarily have to visit trade shows in China to do this. When it comes to payments, most sellers will be using T/T wire transfers to pay. Following that there is also Alibaba’s secure Escrow service, and less popular is PayPal, which is the more popular option for smaller payments (like for samples). We will cover all of this in more detail at a later date, as well as contracts and agreement templates. So if you are following along with us, make sure you stay up to date to cover these things in more detail when they become more relevant to the stage at which we are in our launch progress. Use the Alibaba messaging function – This really is very easy to use and again I gave an over the shoulder demo in the live stream video, it’s the only way to effectively carry out supplier outreach with Alibaba. When sending out your email you want to make sure that it’s not too long but includes all of the most pertinent information. Greg also advises asking any questions in a numbered list, which increases the chances that each and every question will be responded to. If you hide questions in big blocks of text, they are easily missed. As you can see, I introduce myself and the company and give some rough estimates of how many units I would be ordering. Remember that you want to look like a substantially large ecommerce seller, even if you are just starting out launching your first product. Don’t worry if you don’t get the estimates quite right. From here I listed out the specifications for the product I am looking to manufacture, and then asked a numbered list of questions about things like adding logos, sample times and costs and if they are a manufacturer or a trading company. Greg mentioned this useful piece of information which is that you want to ensure suppliers are manufacturers and not a trading company. What’s the difference? A manufacturer actually products the product in their factory. Whereas a trading company buys it from another factory and sells it. The reason for this is that you don’t want to add another level of complexity, time and communication to your supply chain. It’s always best to purchase directly from the manufacturer. An easy way to find out whether a supplier is a trading company is to ask – usually you will get an honest response. Other routes include inspecting their Alibaba listing which will sometimes state it. Or you can use the “common thread” test and take a look at what other products the supplier sells. If we are asking about travel pillows and a supplier sells lots of other products that are made with fabrics, other types of pillow etc. then it’s more likely they are the manufacturer. Whereas if a supplier sells a wide range of products that require different machinery or processes to make, then it’s likely they are buying in from manufacturers and selling as a trading company. 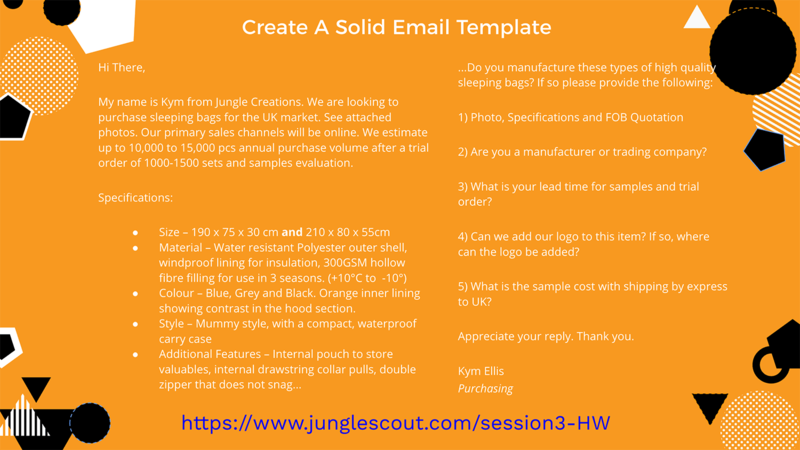 As you can see in my example email template, I created some specifications for my sleeping bag product idea. I just wanted to share a few insights of how I did this, and hopefully you can repeat the same processes to spec out your own product ideas. Scour all of your competitor reviews, the good the bad and the ugly – this gives you an idea of what customers really like, and what they really don’t like! I was using all of the information from those three tips above to come up with my ideas. I may still tweak the specifications yet as this was just my initial outreach to get an idea of cost. Overall, reading reviews really helped me make a lot of decisions. For example, for sleeping bags a lot the negatives were about them being too cold, damp, or the wrong size. An easy win for that is to do a couple of sizes for different sized humans, and make sure the sleeping bag material is warm, suitable for more than one season, and has water-resistant properties. I also saw a few neat ideas like having double anti-snag zippers, an internal pocket for valuables and drawstrings on the hood for a mummy sleeping bag to keep the warmth in. 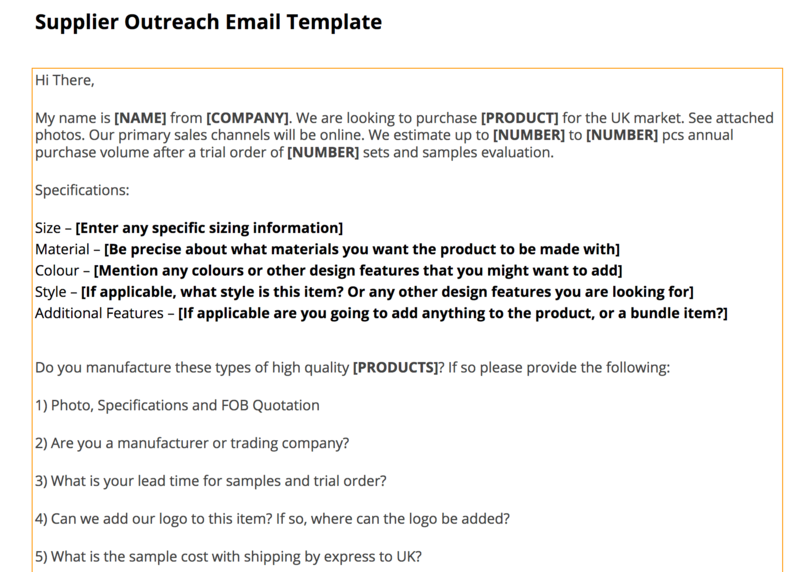 This was the most time-consuming part of my supplier outreach at this stage. Finding and sending out the emails once I’d got my template nailed down was actually really simple. How Many Suppliers Should I Contact? He also advised using a dedicated email address for sourcing. Greg still uses Gmail for his own Amazon business and has never had a problem so don’t worry about getting a business email. Once you start outreach you will be contacted by Alibaba and suppliers alike for eternity about all manner of things. It’s really not ideal to have all of this coming into your primary email – trust us! So now we’ve got this far we are at the stage where we can calculate profits for our top product ideas and make that exciting final decision. We *are* still going to make some assumptions at this stage. For example, we will get a much better idea of the true cost of shipping and customs later down the line when negotiating with suppliers and other third parties. But these guidelines that Greg shared gave some good rough indications that we can use to help us decide which product is going to be most profitable. 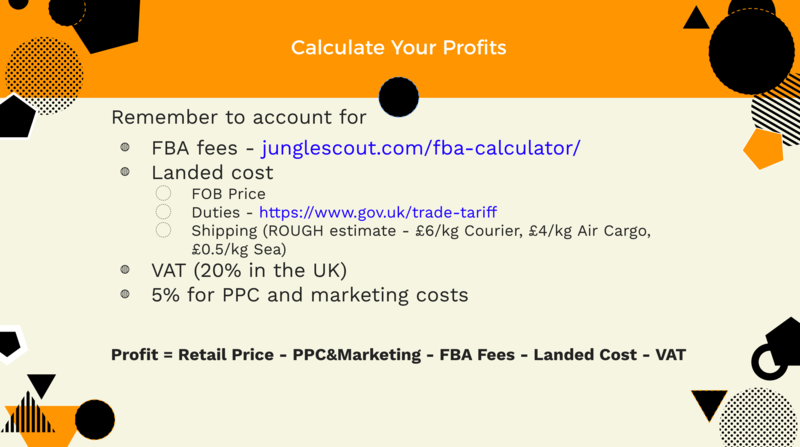 If you are struggling to figure out your FBA fees you can use Amazon’s FBA calculator – check out this useful page which explains how to use to tool, with links to FBA calculators across marketplaces. Greg also got an idea of the cost of duties using the UK government website. 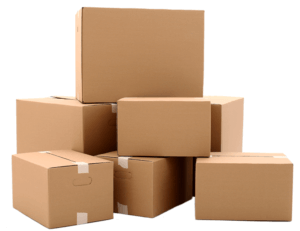 The shipping estimates are rough, but this gives us some numbers to work with at this earlier stage of selecting a product. VAT in the UK is 20% and we have accounted for 5% for PPC and marketing costs, which is playing it safe and allowing for extra spend. As you can see, this results in a healthy profit margin of £8.35 and a ROI on Landed Cost of 125%. Greg shared in the webinar that he always aims for 100% ROI on landed cost, so this is a good start. I have updated these figures slightly from those shown in the webinar, as the VAT calculation was slightly off. VAT is 20% in the UK, and this is of the subtotal of the product, not the full RRP. So if we wanted to sell this product for £26.99, then the subtotal would be £22.49, and the customer would also pay £4.50 VAT. Here’s a useful calculator tool to calculate your VAT ‘backwards’ – handy for when you have a final retail price to aim for, and need to know how much VAT is. We will definitely go through the relevant steps to set up your business to sell in Europe and VAT requirements at a later date. At the moment we are still in the product research and sourcing phase. Once we select a supplier, there will be a ~2 month buffer period for us to get all of this stuff sorted out before any inventory lands in the UK. Which Product Am I Going To Launch? This decision was made based on a balanced view of all of the product research criteria we have been investigating these past three weeks, including demand, competition, how easy it should be to source and most importantly, how profitable the product will be. I mentioned this in this weeks session but it really is a case of balancing all of these criteria and more out against your other product ideas and deciding which works best for you. Everything single product idea will come with its own benefits and challenges and you also need to weigh this in when making your decision. For example, some first-time sellers go for less risky products or cheaper items that require a smaller initial investment. Greg seemed happy with my decision and I am excited to see this through. We will be launching with a sleeping bag product – that is unless we run into any issues that I haven’t already spotted. As I mentioned above, you can access the email outreach template in this week’s homework file. There is also a tab for you to log all of your supplier responses so that you can easily assess which ones to communicate with further, and another tab to log your profit calculations for your top ideas. So your homework for this week is, you guessed it, to start your supplier outreach, do your product profit calculations and come back for Session #4 next week having selected which product you would like to launch. 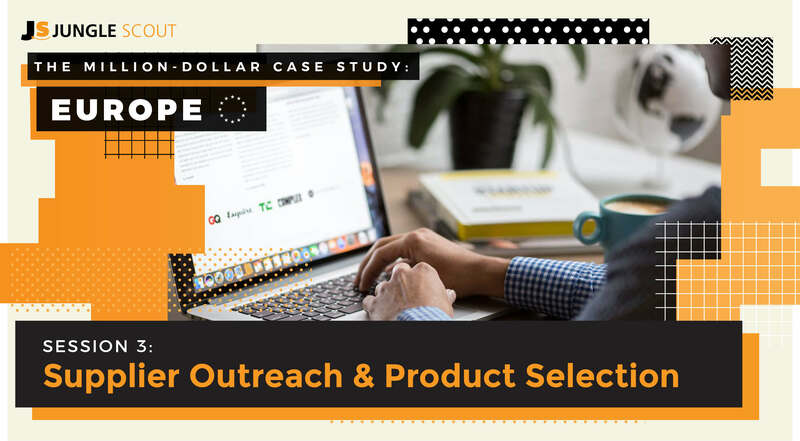 From here, we’re going to dig a little deeper into how to assess your Alibaba responses, how to find the right supplier and what common mistakes to look out for. By the end of next week I want to be ready to order some samples! If you are following along, make sure you check out Session #4 with importing guru Manuel Becvar who has some top advice on working with suppliers in China. To get a full list of each session’s recap, head to the MDCS: Europe overview page here. Thanks for all the great content, very motivating and helpful ! The homework sheet has been deleted – could you please upload it again? Hi Veronica, thanks for the heads up! I’ve updated the link, but you can also access the homework sheet here. Just make sure you’re on the correct tab that corresponds with this session – there are 2 tabs for session #3. How would I guesstimate the shipping costs as a newbie? I use OnPallet to guess how many can fit onto a single pallet, then multiply that number by $800 or so. However, lately, I’ve gotten even lower shipping costs than that. Hi, I’m just going through the profit calculating for a UNITED STATES based store. How does VAT apply there for these calculations? It seems maybe that’s just something I’ll take into account later with my sales tax? For now I’m just wondering if I need to factor in any “VAT”/tax amount into the specific profit calculating formula shared on this post/session. Thanks a lot for providing sucha useful training material. 1.If my company is based in Netherelands can I still receive the 20% tax back if I import to Uk? 2. How can I make sure that the product I order from Alibaba are in good condition and when they arrive to Amazon I won’t confront any issue with customer complains or Amazon? Because it seems Amazon can even ban the business accounts if they are not providing the proper service. Is this actually true? Is there any way To inspect the product inside the factory in China? 3. Do Alibba suppliers transfer products directly to Amazon warehouse or they are only transfering as FOB? If yes, should I as them to send as DDP or FBA Amazon? I’m not sure if they act as freight forwarder or I should always use freight forwarder to do the custome retaled tasks? 4. And my last question is about trademark. I would like to start selling at Amazon but it seems I need to apply for trademark before I start the business. What are the risk of slling on Amazon without trademark? No problem, thanks for joining. Let me try and help you out here! 1. For sure – you can register for VAT any where in the world. Then when you import goods from China > UK you will pay Import VAT. This is the part you can “claim back” when you file your VAT returns later on. You would also still need to collect the 20% on each product sold and pay this back to the authorities. 2. We use Asiainspection.com to inspect all case study products in the factory before we pay the final payment and ship the goods. They do a partial inspection for us and it’s very thorough. They send a detailed report with photos and descriptions on all areas of the product spec. 4. You absolutely do not need a trademark to start selling on Amazon. In fact, since the trademark process can take several months, it’s advised you start selling anyway, and then apply for a trademark and enter the Amazon brand registry down the line. This way you can start making money and growing your product listing, reviews and rankings. Having a trademark eventually is beneficial since it gives you very good protection against counterfeit products being sold using your brand name, and additional marketing tools like Enhanced Brand Content. Read more about Amazon Brand Registry here. the link for the template is not longer available. The links were temporarily disabled because of a link migration and should work now. I am enjoying this case study, but was wondering if you could answer a question for me. Greg estimates that ocean shipping is roughly £0.5 per 1kg. Does this take into consideration customs fees, and shipping from the port to Amazon’s warehouse? If not, how is this calculated to provide a better estimate of ROI? These were just some rough calculations at the earlier stages. Custom fees (duties) were also accounted for as listed in the post. It’s always a good idea to get a reliable quote for shipping including the trucking services from the port in the destination country to Amazon’s warehouse if possible. This will give your profit calculations greater accuracy. If you can’t figure out a quote with a freight forwarder straight away, then you can usually guesstimate the ocean freight and shipping costs to the fulfillment center. Finally, note that we didn’t account for import VAT, because as a VAT registered seller, we would get that back in our VAT return. If you are not registered for VAT then you would have to pay 20% import VAT in this scenario, and you would not be eligible to get this money back. I notice that you have factored in 12% duties in your calculation, is this just import tax? I seems quite high for the importation of a sleeping bag. Hope this helps, many thanks for reading! first of all, I wanted to say thank you for all the value you provide! Keep in that direction! 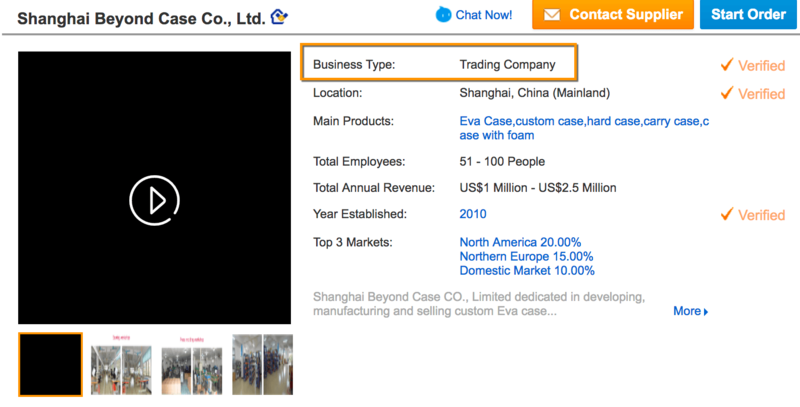 My question is: I am looking for a product on Alibaba but there seems that all companies are Trading Companies. I’ve only managed to find three manufacturers. What are your thoughts on this??? Maybe some products are sold only through trading companies? am I right? Glad you enjoy the resources – that’s a great question. Greg’s advice is always to try and go with a manufacturer where possible. The reason being is to keep your costs low. When buying products from trading companies, you are effectively paying both the manufacturer and the trading company. Having said this, one of the guests on this cases study and sourcing expert Manuel, said he actually uses a few trading companies himself and it works great. My advice would be to reach out to the three manufacturers and a selection of the best trading companies that you have found as per the advice from this session. That way you will get an idea of their quotes and start to get a feel for how easy they would be to work with. I wouldn’t avoid trading companies completely, BUT you need to make sure that you are getting your product at a good cost. After all, your profit margins are the lifeblood of your business. Hi, these case studies have been so useful, so thank you! Or is the reason it’s not added here because you’ll be claiming back that VAT? Hi Kym, thanks for sharing what you are doing, great job so far. I have a basic question regarding choosing the right product. i’ll asked it by giving you en example (that’s not my product, just a test case i’ve done). at the beginning , you’ve used the web app to find some ideas. 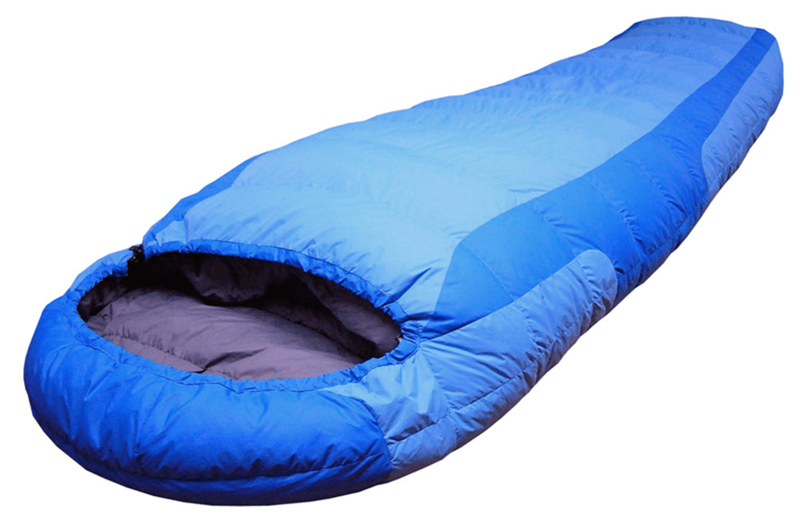 let’s say you find “Ultra-light Warm Weather Rectangular Sleeping Bag”. the next step will be to use the chrome extension to further research this niche/product. 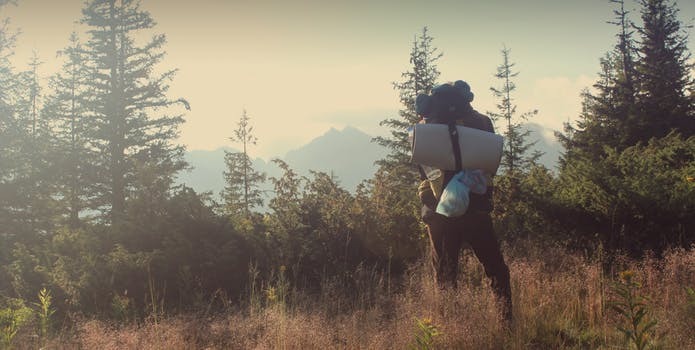 using “Ultra-light Warm Weather Rectangular Sleeping Bag” as the main keyword will bring awesome results and tell you pretty much that this is a good idea. however, using “sleeping bags” in the extension will bring 180 degrees conclusion. what is the best practice ? should i always use general topic as the main keyword ? or should i be more specific and stick to the results ? If I understand your question correctly, you want to know whether to search for “Sleeping bags” or a long-tail keyword, such as “Ultra-light sleeping bags” to drill down into a niche using the chrome extension? The answer to this is: do both! In my case, my specific keyword is “mummy sleeping bag” which is the style of sleeping bag I am manufacturing. So I want to know how the competition and sales estimates are doing for mummy sleeping bags during my research. However, it is still a “sleeping bag” and other types of sleeping bags are still going to be my competition. Of course a niche keyword like “mummy sleeping bag” is very specific and people searching for that are more likely to be interested in my product. However, these terms usually have less search volume than broader keywords like “sleeping bags”, so obviously I want in on that action too. Hi Kym, thanks for your info here loving the step by step simplicity! I have a question that I don’t think has been covered so far and applies to an earlier session really… what is your advice on competing with a seemingly low competition and easy to source product but one of the top current sellers is amazon themselves? Is it v risky to try and compete with such a bohemoth generally speaking? His response was that he has no problem going up against Amazon, their listings are usually quite poor and they don’t bid on PPC. Therefore although they might get high sales volumes, it shouldn’t be that difficult to differentiate your product. One thing that I would be interested in finding out is the depth of the market. If there are only 1 or 2 sellers (including Amazon) getting good sales volumes, and the rest performing pretty poorly, then I would want to investigate further and find out why that is. If the sales are spread out across the top 10 however, then you can assume decent depth of market.